During the talk Fabio will present a selection of the most recent collaborative artworks I produced over the last few years, working with engineers, designers, financial data analysts, perfumers and fortune tellers. I will discuss In particular how a culture of exchange, open-source tools and collective DIYism is affecting artists’s relationship with technology and the notion of authorship in art production. And how this can make up for an enriching and transformative experience. The last part of my presentation will focus on the challenges and benefits of my residency at the MMCA Seoul and it will introduce the artwork I created while there. Working across a range of mediums including sculpture, print, poetry and interactive installations, Fabio Lattanzi Antnori’s work examines the language of power and control of corporate systems and its effect on the belief systems of the individual. He graduated from Goldsmiths (2013) with an MFA in Computational studio Arts. Antinori’s work has been exhibited internationally in museums and galleries, among which SeMA Seoul Museum of Art, V&A London, Holon Design Museum, The RYDER projects, PiArtworks, Annka Kultys, MoCA Shanghai, Hangzhou Triennial of Fiber Art, Kaunas Biennial, MAK Museum Vienna. Antinori lives and works in London. 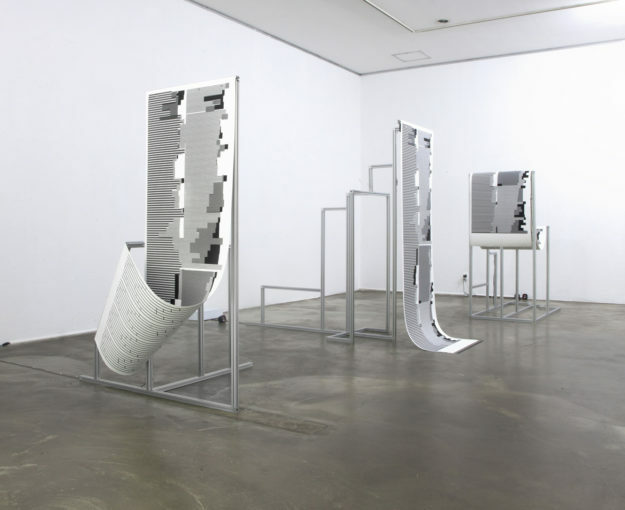 Recent ELP Artist in Residency Daisy Billowes will be giving a talk about her contemporary art practice in relation to Print and the printed image. For the past 7 years she has been studying and questioning the different forms of print in relation to the history of craft, mechanical and digital (re)production. Her talk will encompass these issues and how she addresses them in her contemporary art practice. Click HERE to RSVP via EventBrite. Addressed in this lecture will be the idea that artworks possess multiple identities over time. Elisabeth Reissner has an MA in Drawing (Camberwell), a Postgraduate Diploma in the Conservation of Easel paintings and a PhD in Art History (Technical Study Within Art Historical Scholarship: ‘Meaning in Making’ With Particular Reference to the Works of Paul Cézanne at The Courtauld Institute of Art). 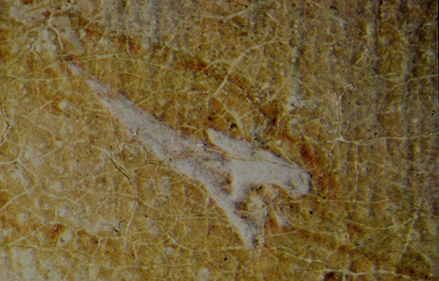 She has combined work as a paintings’ conservator in galleries and museums such as the Frans Halsmuseum and Tate, with teaching on conservation, curating and art history undergraduate and post graduate courses at UCL and the Courtauld Institute of Art. Her own practice gets a look in every now and again. On Tuesday 16th October at 7pm we will be welcoming our next Artist Talk speaker Thomas Gosebruch to the studio where he will be discussing his current works on the subject of crisis management. 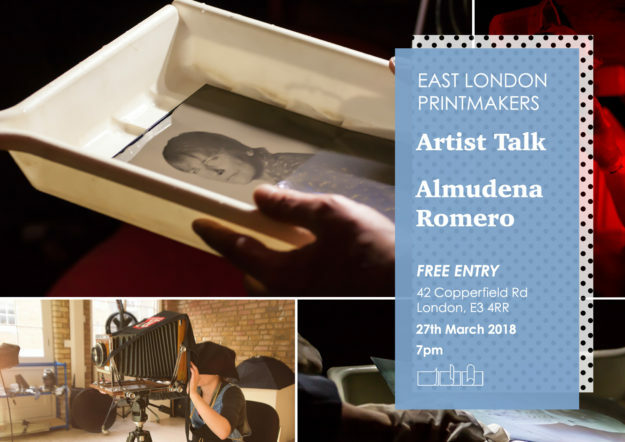 Artist Almudena Romero will be explaining her wet collodion projects, focusing on her tintype work, as well as on the commissions she has received to set up pop- up collodion darkrooms at institutions such as the V&A, the National Portrait Gallery and the University of the Arts London. Almudena will be explaining the history and the technicalities of the wet collodion process and how museums and galleries might approach the subject of teaching early processes in-house. Born in Madrid in 1986, Almudena Romero is a visual artist working with a wide range of photographic processes from early printing techniques such as cyanotype, salt printing or wet plate collodion, to new technologies including 3Dscanning and printing. Since 2015, Almudena has shown and explained her practice at TATE Modern-TATE Exchange, TATE Britain, The Photographers’ Gallery, the Victoria and Albert Museum, the Whitechapel Gallery, the London Art Fair and the University of the Arts London, and delivered courses and lectures at National Portrait Gallery, the Mitsubishi Ichigokan Museum, the Mapfre Foundation, the Sotheby’s Institute of Art, University of Westminster, Kingston University and Southampton Solent University. 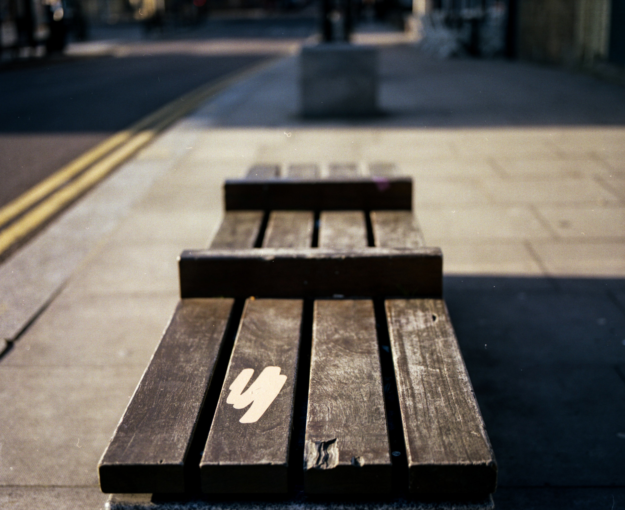 She has also received commissions to produce installations in public spaces from Team London Bridge, Southwark Council, Emergency Exit Artist, Wellcome Trust and University College London. Her work has been published in TimeOut, DUST magazine, Uncertain States and Photomonitor. Almudena’s practice uses photographic processes to reflect on issues relating to identity, representation and ideology; such as the role of photography in the construction of national identity, or the link between photographic archives and colonialism. Her work focuses on how photographic processes and technology transform the notions of public, private, individuality, identity, memory, and, in general, the concept of the individual. Almudena’s works touch on how perception affects existence and how photographic processes contribute to organising perception. 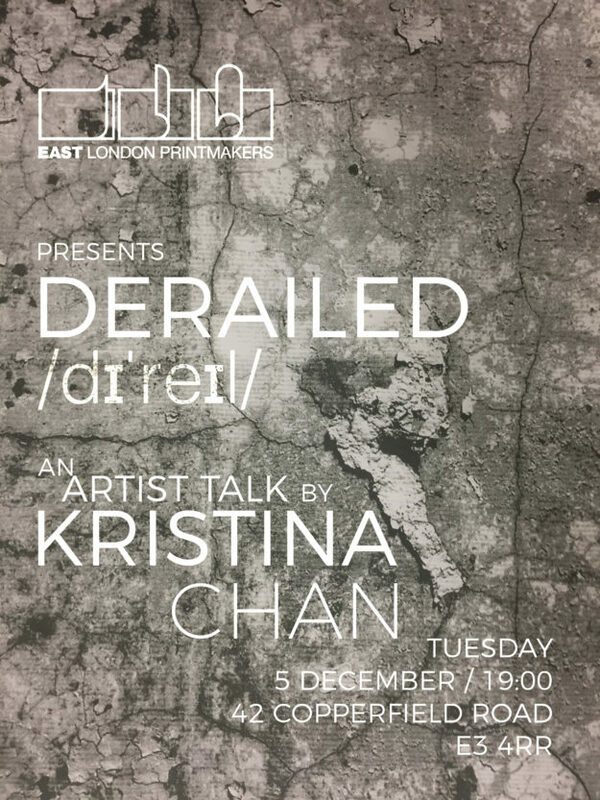 Derailed is an artist talk by current project key holder Kristina Chan. 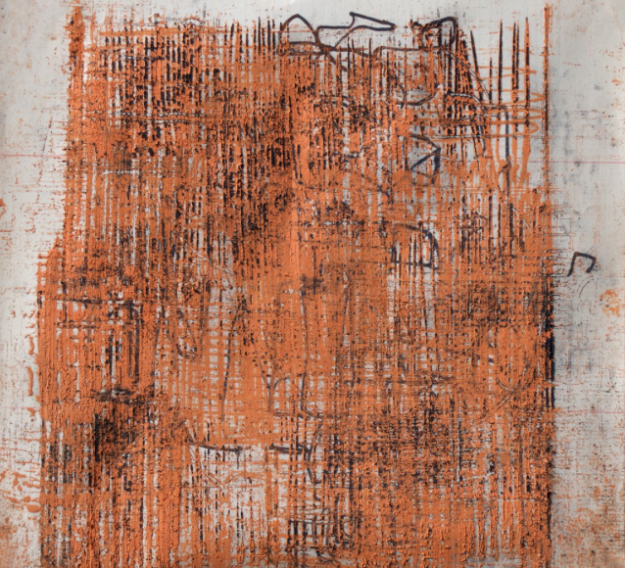 It features large-scale panelled prints derived from a discovered train wreck. These works are part of a developing series exploring the ideas of shelter and the repercussions when these preconceptions fail us. Kristina’s work is a culmination and accumulation into site specific history to depict socio-cultural entropic narratives. They explore the correlation between architecture and sculptural landscapes of derelict and disused spaces. I seek sites where the intersection between function and intention have fallen into decline and disrepair, where untold histories recount themselves, in all their brevity, satire, beauty, and collapse. 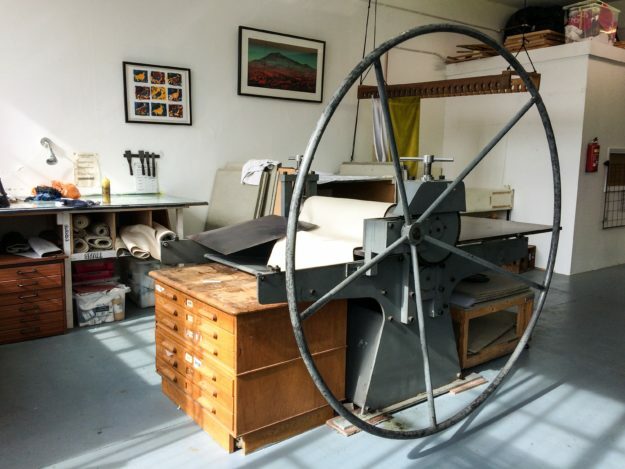 Please join us at East London Printmakers on 5th December at 7pm, where Kristina will speak about her artistic and material practice, as well as the inspirations and exploration behind these works.